Truth be told, I don’t plan out these posts—I make a spur-of-the-moment decision on who to write about. Sometimes it’s a referral (always appreciated!) or just browsing artists online. Since I don’t formally keep track of who we’ve talked about, sometimes it comes as a complete shock that after 4-5 years now, I haven’t reviewed certain acts. Today’s featured group is one of the best-selling acts of all time and the album is on the Mount Rushmore of music history. Early 1971, Linda Ronstadt and her manager John Boylan recruited Glenn Frey and Don Henley for their band. After making a record together, Frey and Henley decided to break off and start their own thing—even asking Linda for her feedback on other potential members. David Geffen, co-creator of Asylum Record, personally signed the new band. He bought out their contracts and sent them to Colorado to form a bond as a band. They played a show under the name Teen King and one under the Emergencies. It wasn’t until a peyote-and-tequila-filled outing in the Mojave Desert when they came up with the name the Eagles. The group had backing of so many musical icons in the moment, including Jackson Browne, they didn’t have any trouble finding opening gigs or backing around the country. Their first album was released less than a year after formation, and it spawned three Top 40 singles. After selling over a million copies, everyone around the band felt they were on to something big. Their next three albums would all do extremely well too—selling roughly 15 million albums worldwide. But it was their fifth studio release Hotel California that would truly alter the timeline of music forever. The band felt this was a concept record, attempting to create a bicentennial album for the U.S. since it was released in December of 1976. It took roughly eight months to record and was done between Miami and Los Angeles. Black Sabbath was recording at the same time in Miami and many of the Eagles tracks had to be re-recorded because the heavy-metal band’s volume encroached on the Eagles equipment. 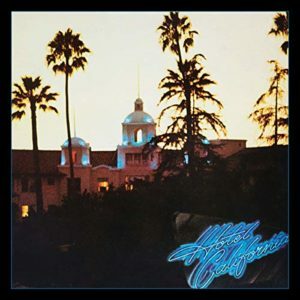 The song Hotel California was refined and recorded over several takes, and the best parts were all spliced together for the record. It took nearly 40 edits to get to the final version you hear on the album and the band wasn’t certain it would become the smashing success it did. The mastery worked, as the album has sold over FIFTY million copies worldwide. It’s #37 on the Rolling Stone 500 best of all-time list, it topped the Billboard charts and won two Grammy Awards. 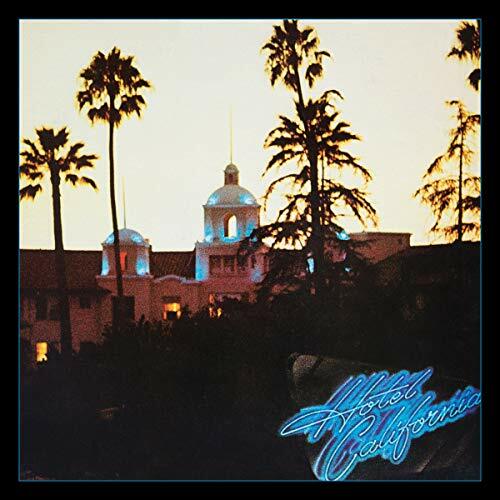 There is something about the title track for Hotel California that has resonated so well over the decades. Most radio friendly songs are 3 minutes, give or take – but it comes in at nearly 7, and still gets major radio play all over the country to this day. Many people don’t celebrate the entire Eagles catalog, but still enjoy that particular tune. Their music tended to be a bit folk rock or soft rock, but this album overall is fairly heavy for them and was a nice change of pace. It’s really only eight songs, but most of them are staples for the band and tunes almost anyone can sing along to. The group credits this record to bringing them to their peak, and also causing their subsequent breakup in 1980. Sad as that may have been, their reunion in 1994 leading to the Hell Freezes Over tour exposed them to a whole new generation of music fans. MTV was playing the grunge revolution and the acoustic version of Hotel California and helped the group sell millions of additional records. This likely isn’t something new for you to try out today—but sometimes it’s just as fun revisiting a classic. At a measly six bucks and change (or pull it up on your favorite streaming service), they’re practically giving it away. You can throw it on while driving down a dark desert highway, cool wind blowing through your hair. You can check it out any time you’d like, but you may never leave it. Happy Tuesday!